I didn’t sleep much on the plane. It was quite cold in Johannesburg and we met Ray and Laura from the BBC at the airport. 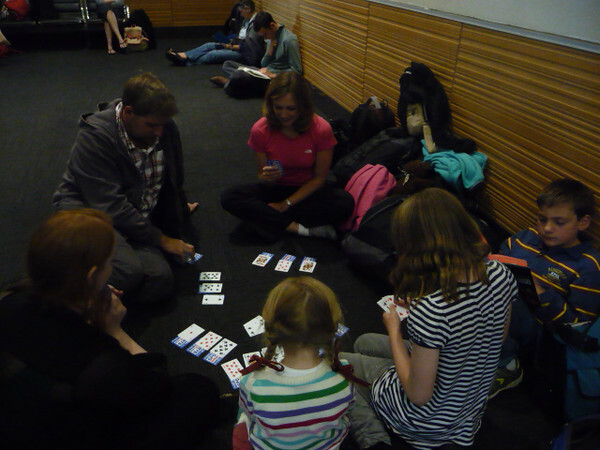 We played cards because the flight was delayed. It was hot in Blantyre and I lay down on the marble floor to get cool. My chinchilla has a marble slab for the same reason. Blantyre airport is very small and they use a tractor to pull the baggage carts. It was a massey ferguson and dad was excited about it. There were lots of porters waiting to carry our bags and it was very noisy as we left the airport. We stopped at a stall on the way to where we were staying. There was a lovely toddler on her mum’s knee. He held my hand for a second and then got shy. Lots of children my age have babies wrapped up in material slung across their backs and it looks really heavy. None of the babies cry. There are no pavements and even children walk along the road. There are people walking everywhere. I spotted 5 Mary’s Meals shelters on the way to where we are staying. It got dark very quickly and Mum made me put on insect repellent which tastes bitter if you get it in your mouth. If I roll over at night a mosquito may bite me through the net. I am going to sleep right in the middle of my bed. It is good to hear that you arrived at Johannesburg safely. I learned that you are now on the southern side of the globe as you wrote it was quite cold there. We are always happy to read your articles even if you are far from your home. 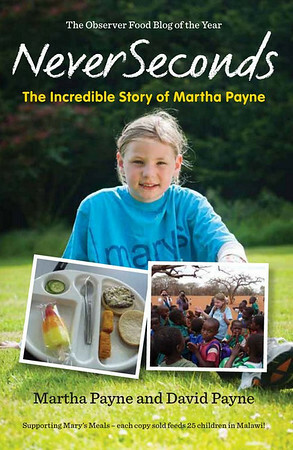 I am so so PROUD of you Mary. You are truly inspirational and have such a sweet heart; never lose that. Veg and family, what a wonderful experience! Congratulations to you all for all you have achieved. I shall watch out for you on TV. I assume one of the old type tractors where you sit on a seat with big wheels. Not the modern monsters. When I was in Cyprus I walked to a farm with a lovely Russian friend called Lena. The farmer was riding one of these old tractors. There was not much to see on the farm as it was end of May, and for Cyprus, end of the season. The farmer gave us two pumpkins. Lena kindly carried them as I was tired. Lena said her dacha was bigger than the farm. A dacha is a country house. I think she (or at least her mother) has a small holding like you. She has offered to send me seeds for black tomatoes. In Russia they have many, many varieties of tomatoes. I told her about you. She was very, very impressed. Later that evening we ate at Nicolas Tavern, a very good Greek-Cypriot restaurant where they cook kleftico (a lamb dish) slowly slowly over many hours in a log-fired clay oven.